In my book that teaches me how to read music doesn't say anything about music theory. Are these 2 separate entities? Well, kind of... but they are interlinked! What we generally know as the 'practical' side of music tends to be the actual playing of the instruments and theory is the more technical side of note values and music reading. 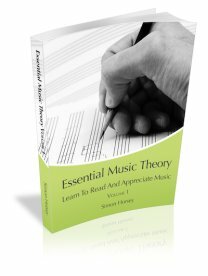 So actually, the fact that you are learning to read music means you are learning music theory - even if it isn't labelled as that! I like to keep them connected myself when teaching, as I think that learning the theory is very important for your playing and it is very difficult to learn music theory without reference to playing an instrument! Good luck with your playing - hope it goes well!